We are surrounded by devices. Building a new device requires high-level technology integration. A device can be anything from a kitchen appliance or a payment terminal to a digital watch or music player. Computer peripherals are also devices as well as the growing market of Internet of Things (IOT) and sensors. Building a new device from scratch will probably require several months of work. Even if the electronic design is simple, the process required to stabilize a new mechanical design combined with an electronic board and software takes time. While small devices can be developed during an annual quarter, complicated devices and big appliances can take more than a year and may involve very large development teams. 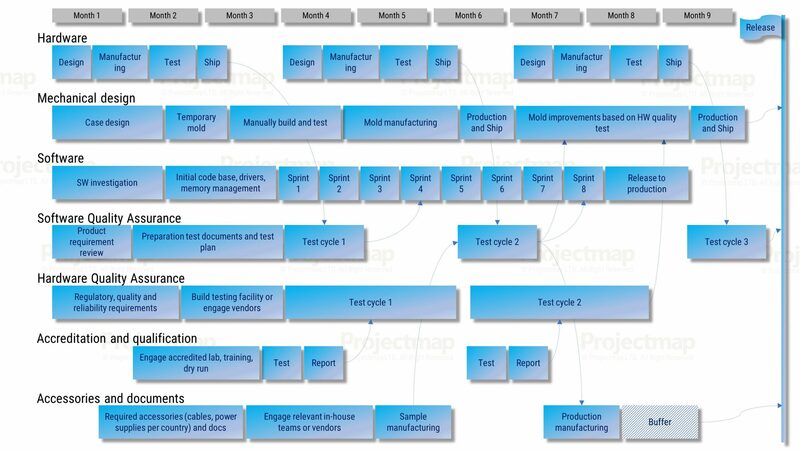 This example shows a typical 9-10 month project plan, which should be adjusted for the specific device being developed to get a realistic projection. Electronic design – the electronic design process includes the logical design, followed by placement and routing. We recommend planning at least three design cycles. The first cycle aims to establish the initial functionality and enable initial testing. The second cycle aims to stabilize the design so it can move through real testing, stress and corner cases. The third cycle aims to yield a production process for an electronic board, combined with a stable package. Electrical manufacturing –unlike software, building an electronic device requires engagement with a factory or at least prototype services to build and test the design. Working with a manufacturer has its own tolls and it should be managed within the design cycles. Mechanical design – while making the first steps in electronic and software design, the team should also plan the mechanical design. It starts of course from the device casing, but other things, like transportation packaging, should also be considered. The mechanical process involves at least two steps. The first one is using a quick mold (silicon for example), which paves the way to mold manufacturing. When designing a low volume device, a quick mold can also be considered. Mold manufacturing – takes time and should be planned carefully with the mold manufacturer, not only for tailoring the initial creation, but also to foresee the time-consuming changes and other changes that will not possible. The mechanical team should report on progress steadily, especially if the device has complex mechanical requirements (free fall for example). Software development – whether an open source operating system like Android, a proprietary system, or just an embedded code to run the microcontroller and chipset – they all need a complete software development plan in parallel with the hardware development plan. Software development may start with technological exploration to find the right technology, libraries and components. Once the codebase is established, the team needs to start sprints, preferably using Agile methods, while taking into account the hardware build progress. Hardware test – is critical for keeping manufacturing costs low and for avoiding long term liabilities for the company. Requirements can vary, so the team first needs to agree on the test level. Should it work underwater? In dusty/damp/other conditions? Free fall? How many clicks each button is expected to experience during the device life cycle, etc. Once the requirements are in place, the hardware test owner should define the test procedures that can be done in-house and those that require a lab. Only then can the preparations start towards first samples. Software test – working closely with the software development team, the software test team should develop the test cases required to verify device functionality, UI and error codes. Not all device software is available for updates, therefore the software test should be stricter than say, a website test. Certification and qualification – all devices go through some certification process. A common one is the CE/FCC electromagnetic certification. Different applications can require more advanced certification, such as military, payment systems, fuel stations, in flight use, etc. The list of requirements for each certification is turned into the design requirements which are verified in lab sessions. It is recommended to plan at least two lab sessions – the first one for finding gaps and the second for passing the certification. Peripherals and power supplies – are important and can be very tricky if the device is sold worldwide. Every country has its own power supply adapters, regulations and cables. Do not leave it to the last minute and always leave a buffer. Documentation and packaging – finally, the device is going into a box with some papers. These can be a safety guide or a quick installation guide. Package design should consider low logistic costs, in-store presentation (if relevant) and transportation conditions. Good documentation can save the company’s support team a lot of time.